Saute onions and mushrooms over medium heat with butter, olive oil, minced garlic and a little salt and pepper. Saute until onions and mushroom are nice and caramelized. About 25-30 minutes. Slice roast beef into thin strips (I found it easiest to cut them with scissors) and add to the onion/mushroom mixture. Allow to cook 5-10 minutes. 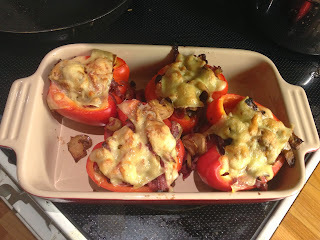 Line the inside of each pepper with a slice of cheese. Fill each pepper with meat mixture until they are nearly overflowing. Top each pepper with another slice of cheese. I served this with garlic bread, which was fine, but another time I might try to cook a cup of rice and mix it with the onion/mushroom mixture - just to make for a more filling stuffing. Also, I think I'll add another onion and another clove of garlic... either that, or use a tiny bit less meat.